It may not have been the goalfest we've come to expect from the division's highest scorers, but Albion's first 1-0 league win of the season was just the tonic after a minor blip in form. 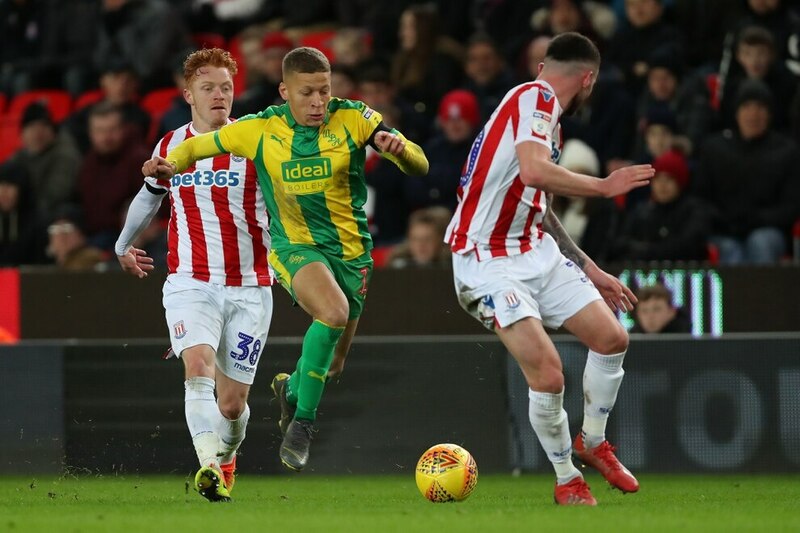 On a typically windy evening at the Bet365 Stadium, it was Gayle who proved the matchwinner, rounding off a well-worked free-kick in the 25th minute to score his third goal of the season against Stoke. The hosts were poor, and toothless, and lost their fourth game out five under new boss Nathan Jones. But after throwing away two games in the past week, Albion proved they were capable of grinding out a victory in the Potteries. There were encouraging full debuts from Jacob Murphy, who looked bright in the first half before fading after a robust challenge, and Stefan Johansen, who threw his shirt into the away end after the final whistle. But it was a return to form for the backline, who dealt easily with Stoke new boy Sam Vokes, and the added steeliness needed to win games in the run-in which will be the most encouraging. 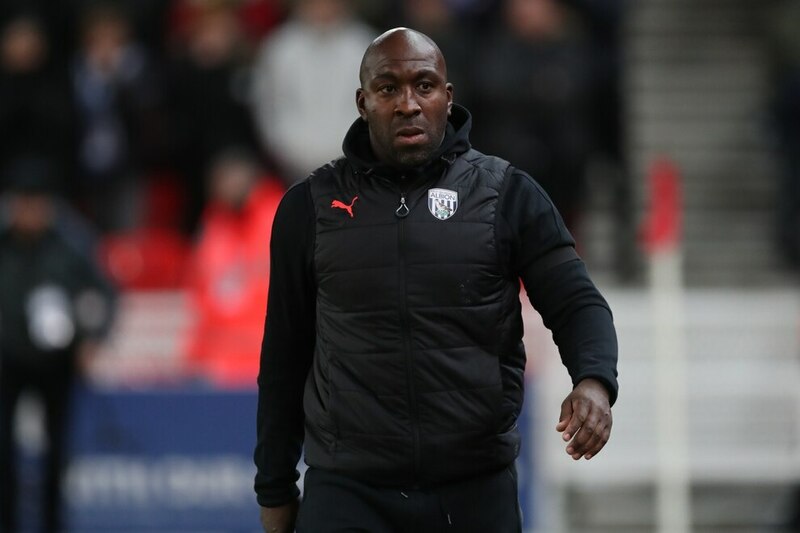 Darren Moore made three changes to his line-up from the last league game, handing first starts to Johansen and Murphy and reinstating Jake Livermore to midfield after youngsters Sam Field and Rekeem Harper played 120 minutes in midweek. Former Baggie James McClean started up front for Stoke, while Saido Berahino was on the bench. Both were booed loudly by the buoyant away end, but it was the hosts who started the brighter, with Peter Etebo blazing a good chance over the bar early on after being found by Joe Allen. 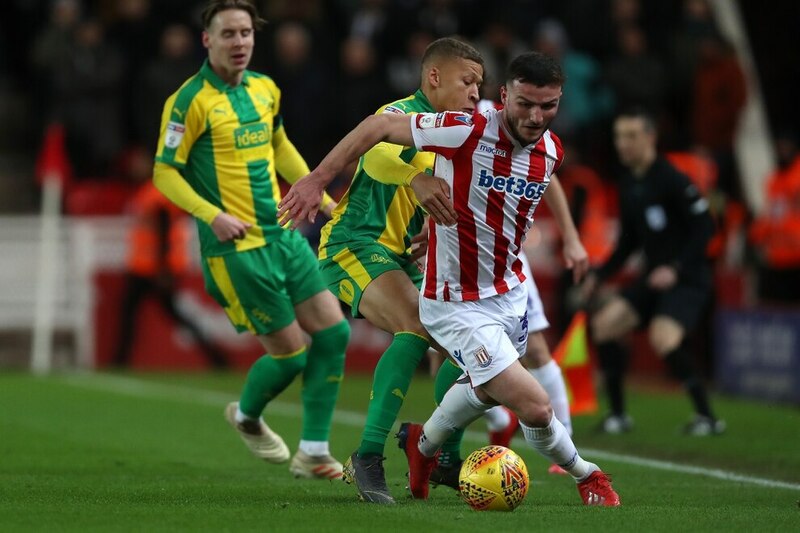 The Baggies had plenty of possession, but it was all in the wrong half, and 10 minutes in Jake Livermore was lucky to escape punishment when he went over the ball and caught Sam Vokes on the ankle. Murphy looked lively up front, and had two warning shots early on before a third mid-way through the half. He was bending his run off the right-hand side and looking to get in behind, but further back, there was a lack of urgency, with too many backwards passes. But then midway through the half, the Baggies took the lead with a well-worked free-kick routine. New boy Johansen clipped an inch-perfect ball to the back post where a criminally-unmarked Ahmed Hegazi expertly volleyed the ball back across goal first time. Gayle was on hand to nod in his 16th goal of the season from just four yards out, and his third against Stoke this term. It sent the 2,900 travelling Baggies into delirium, and play was stopped while stewards cleared a blue flare thrown from the away end off the pitch. The goal gave Albion a bit of confidence, and they started zipping the ball about with more confidence. 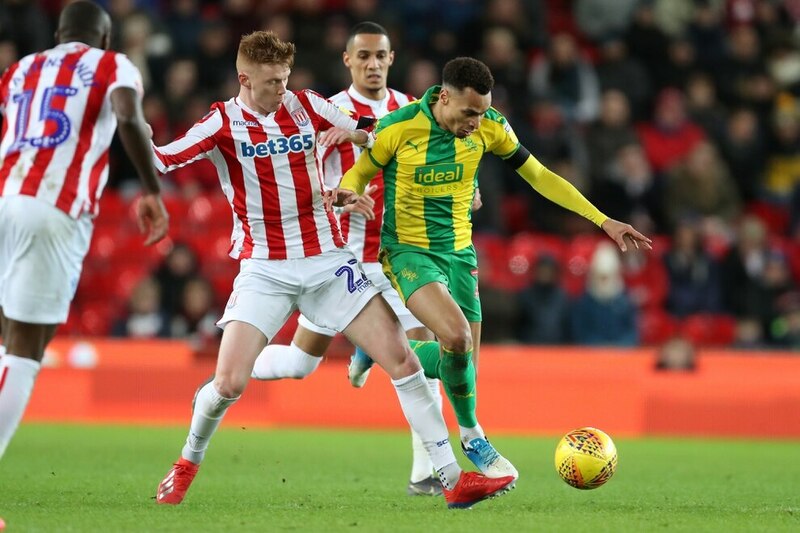 But five minutes before the break the Baggies were fortunate not to concede a penalty when McClean, whose every touch was being booed, crossed a ball that hit Gareth Barry's arm. 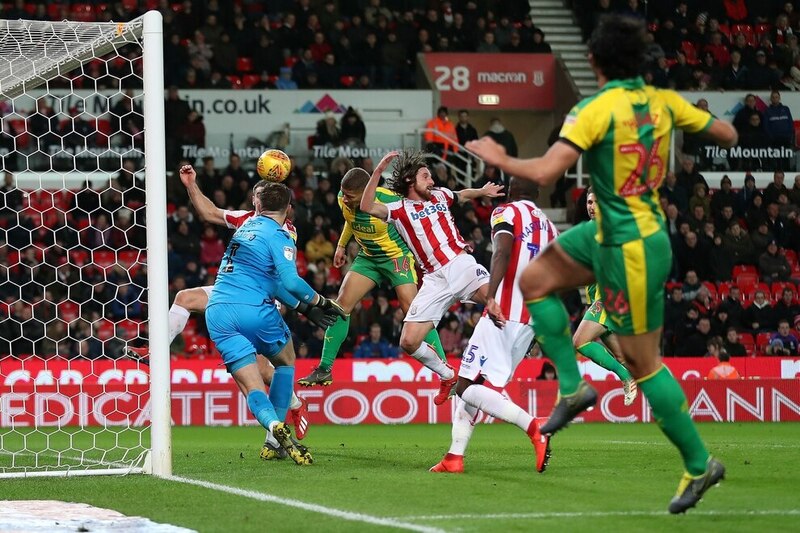 The first half ended with a great chance for Jay Rodriguez when Jack Butland's punch fell straight to him, but he scuffed his first-time effort from the edge of the box with the keeper stranded. The travelling fans roared their team down the tunnel as the home crowd booed. Albion started the second half well as Stoke continued to struggle. 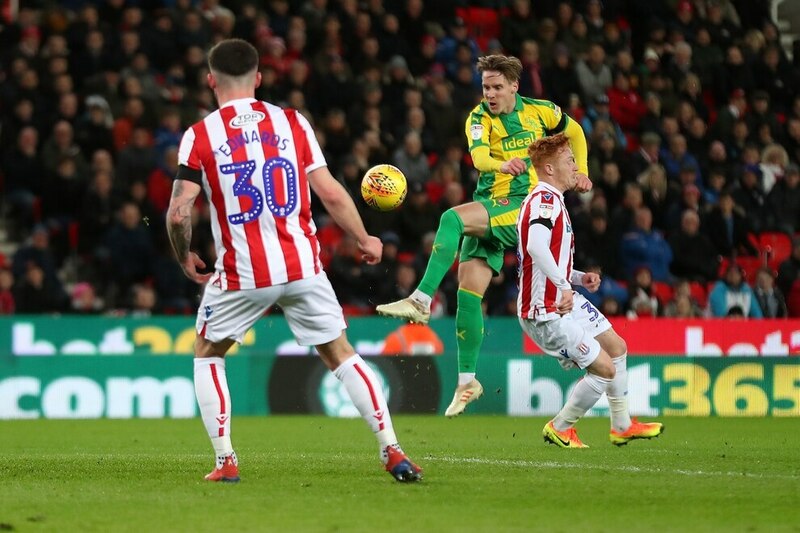 Johansen fizzed a dangerous ball across goal that Tom Edwards nearly put into his own net before the Stoke full-back did exactly the same up the other end. 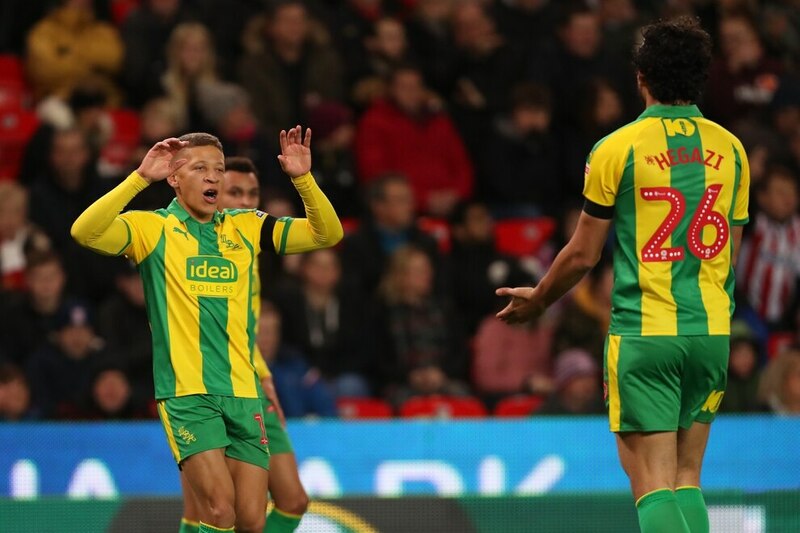 The Baggies needed a second, and were given a warning shot shortly after the hour mark by a fantastic solo run from Tom Ince past three Albion players ended with him screwing his shot wide. The home crowd started to believe, and Sam Johnstone had to get hands to two dangerous crosses. 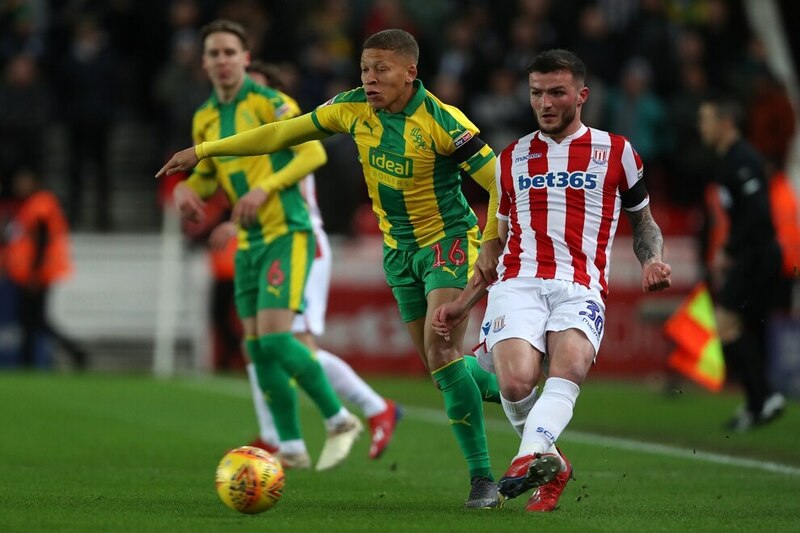 Albion nearly added a second after a lovely passing move ended with Jack Butland spilling the ball in the six yard box, but it fell just behind Gayle. Jones freshened up his attack, sending on Bojan for McClean and Moore responded by bringing on Jefferson Montero for his debut in place of Murphy, who wasn't the same after a robust challenge from Bruno Martins Indi. Rekeem Harper came on with 15 minutes to go, at the same time Jones sent Berahino on. But Stoke rarely threatened in the final minutes of the game, as the Baggies did everything necessary to see the game out. 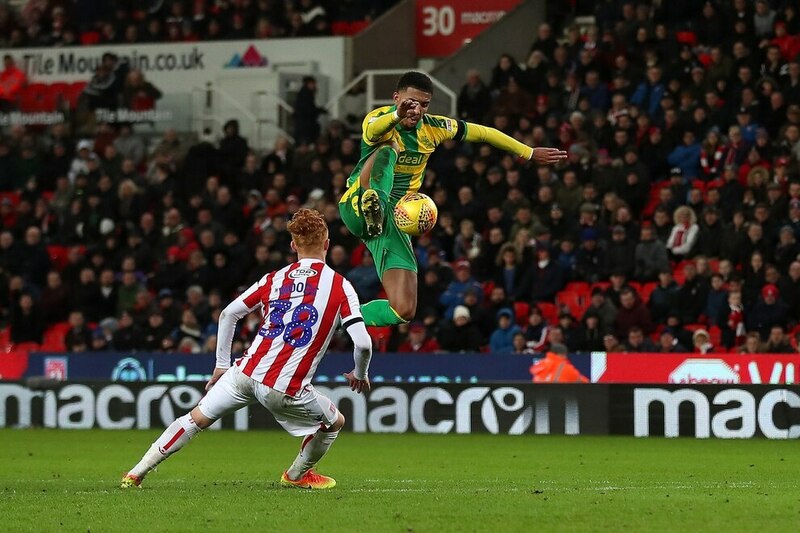 Gayle took a yellow card for a professional foul, Mason Holgate put in a lung-busting run in injury time to alleviate pressure, and Rodriguez kept the ball in the corner. It was a professional victory that has reinstated Albion's promotion credentials on a weekend that rivals dropped points. 08 Livermore escapes punishment after going over the ball and catching Vokes on the ankle. 25 GOAL ALBION - Gayle rounds off a well-worked free-kick to put the Baggies ahead. 38 McClean's cross hits Barry's arm in the box but nothing given. 45 Rodriguez scuffs his first-time shot after Butland's punch falls to him on the edge of the box. 64 Ince bursts past three Albion players before screwing his shot wide. 70 Martins Indi catches Murphy with a forceful but fair challenge that leaves the winger in a heap. 74 Moore brings on Montero for his debut. 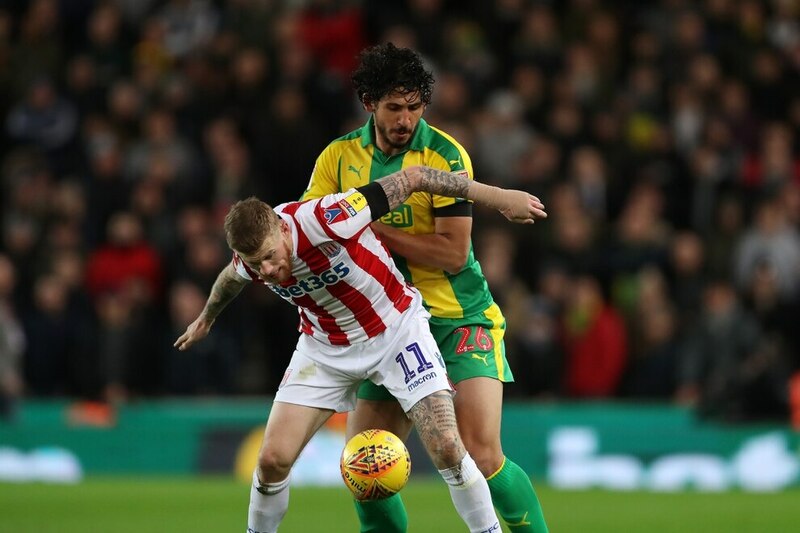 Ahmed Hegazi - Big hand in the goal and a towering performance at the back. 4th, with 53 points from 30 games. 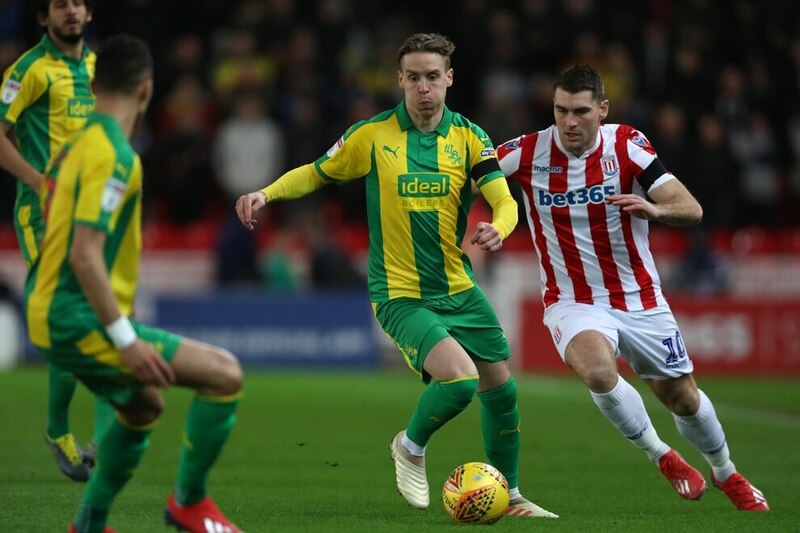 Stoke City (4-3-1-2): Butland; Edwards, Martins Indi, Batth (c), Clucas; Etebo, Woods (Berahino 81), Allen; Ince (Shawcross 90+2); McClean (Bojan 68), Vokes. Unused subs: Federici, Bauer, Williams, Afobe. Albion (4-3-3): Johnstone; Holgate, Dawson, Hegazi, Gibbs; Livermore, Barry (c), Johansen (Harper 81) ; Murphy (Montero 74), Rodriguez, Gayle (Bartley 90+2). Unused subs: Bond, Mears, Hoolahan, Field.